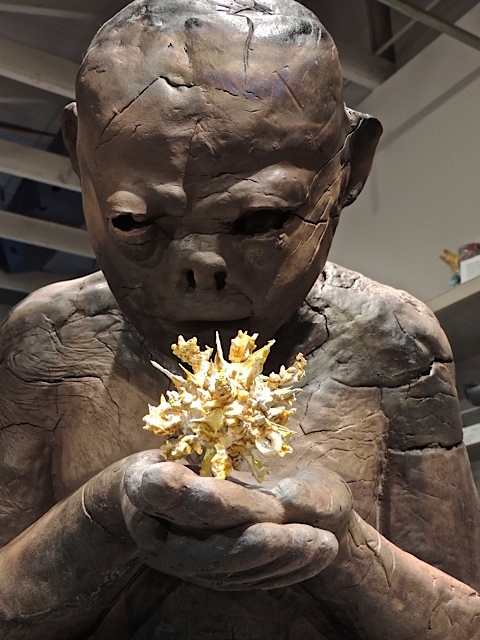 Last Sunday I went in search of a Ceramics Artist's Studio Tour and began my search in Tempe at the ASU Art Museum where I found this incredible piece called "Big Bang" by Paula Price. To be honest, I wa mesmerized by quite a lot of the pieces I saw at that museum. Above I have a little collage of the pieces I liked the best. Sorry, but the first two I have no name for but the man with the frog on his head along with the screaming man attracted me. The next piece is called "Arms Deal" by Ed Blackburn, next is broader view of "Big Bang" by Paula Rice. In the next row we have "Greece, Dali, Magritte" by Noi Volkov (it was the depiction of Dali that drew me in), next we have "Likaflex" by Fred Bauer for all my photographer friends. Below the "LikaFlex" is "French Kiss" by Joe Bova and next to that is one of my all time favorites, "Mortor" by Gregory Roberts. The thing that amazed me about this piece is that anyone looking at it would have sworn it was wood. No, it's ceramic. I apologize about the last piece, I don't know the artist's name or the name of the piece. I snapped it just before leaving when I caught sight of the back of the piece. I have to say that I'm glad I searched out this event and found this amazing display of artistic work. 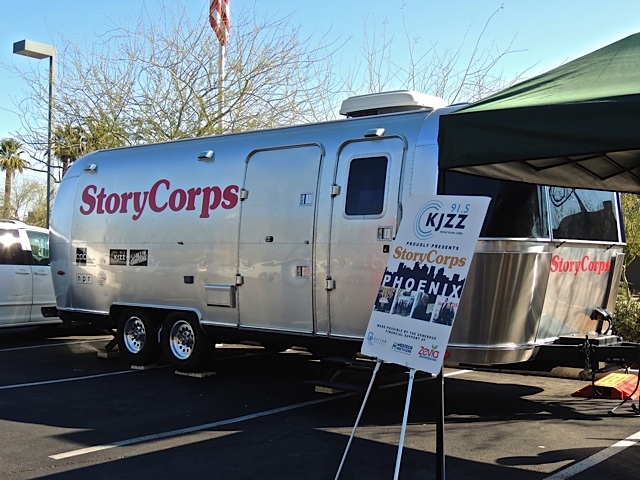 My readers who listen to NPR radio on a regular basis will recognize the StoryCorps name; the mobile recording unit used to record people telling a story of their own life. For those of you that don't know about this project, two people record a short (3 to 5 minute) conversation about something important in their lives. All of the stories will be preserved at the Library of Congress. You can read more about this project here. 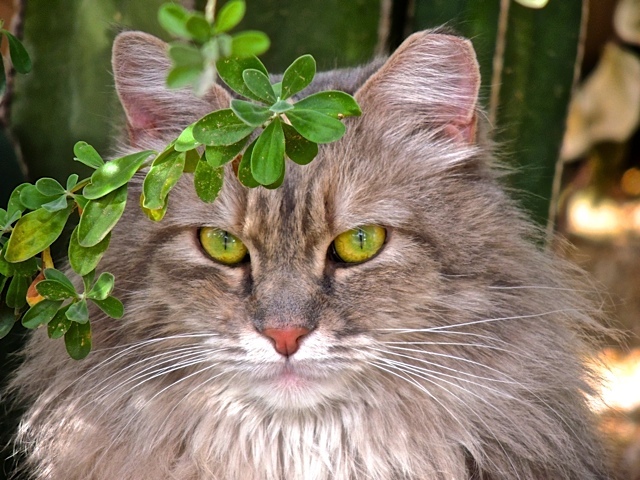 You can even listen to a story or two at that link. All of the appointments available for the Phoenix visit are now full so I'm not going to do this myself but, there was a couple preparing to go in when I was there to take this photo. 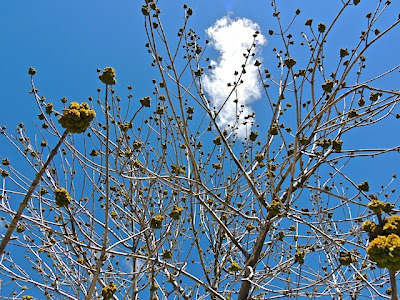 The two trees that shade my driveway are full of buds right now. 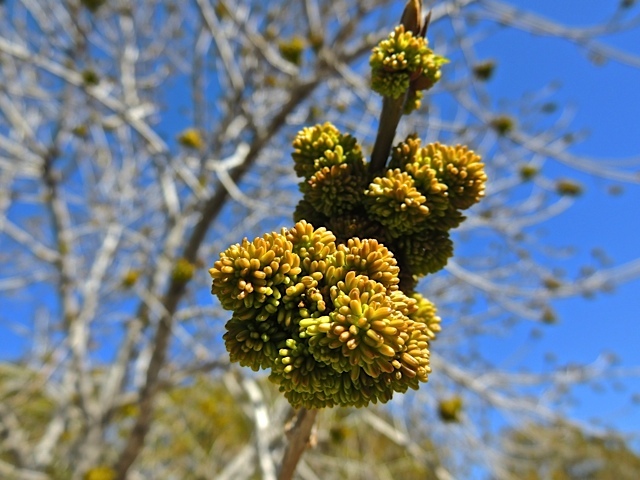 They lost all of their leaves between the mid-January and mid-February and here they are budding already. This short cycle always surprises me. Pretty soon it will be full of green leaves and my shade will return. 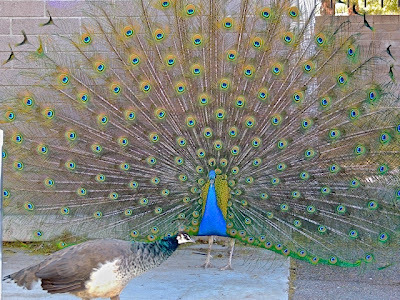 He was feeling a little frisky and was trying to catch this young lady's eye. 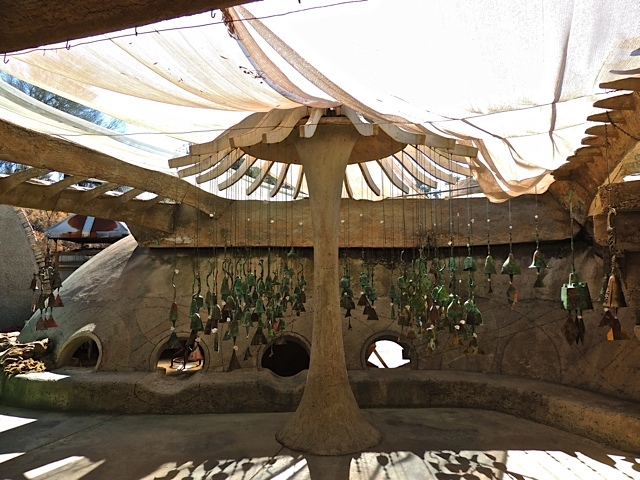 Here is another work room at Cosanti. I love the way the sunlight makes nice straight lines that appear to be coming form the door. This is the room at the far end of the room I pictured on the 22nd (scroll down to see it). There are a combination of brass bells here and clay bells. The clay bells are newer in the collection. You can also see some clay pots and vases to go with them. I love the red glass skylight here. Today I have two more photos from Cosanti that I featured yesterday. The top photo is the visitor's center where you can purchase one of the famous bells or just browse if you prefer. The design of this small building made me say "wow" when I walked through the door. I really like the backbone-like beams across the ceiling and skylight. This is one of the work areas with work tables just out of this shot to the left and in front of us is another display of the just finished bells. The beautiful bells were hanging in several areas around the property and you could choose one from the visitor's center above or from anywhere else on the property that you find one that catches your eye. I picked mine up right from this beautiful rack. 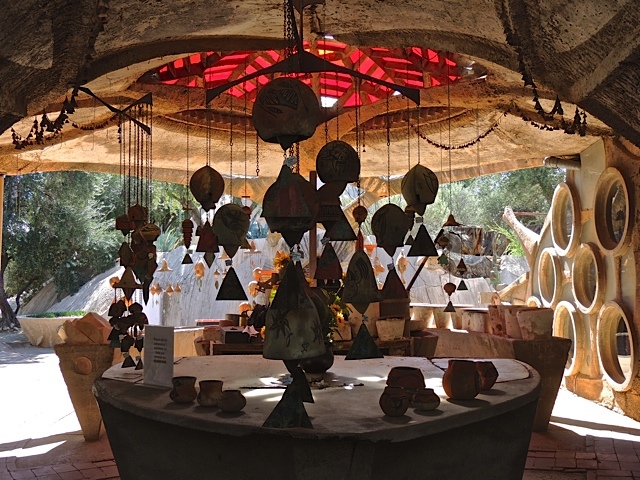 Cosanti is the studios of Paolo Soleri, architect, designer, builder, and artist. His studio has been in this location since 1955 and it's name comes from the combination of two Italian words "cosa" and "anti" which when put together mean "before things". 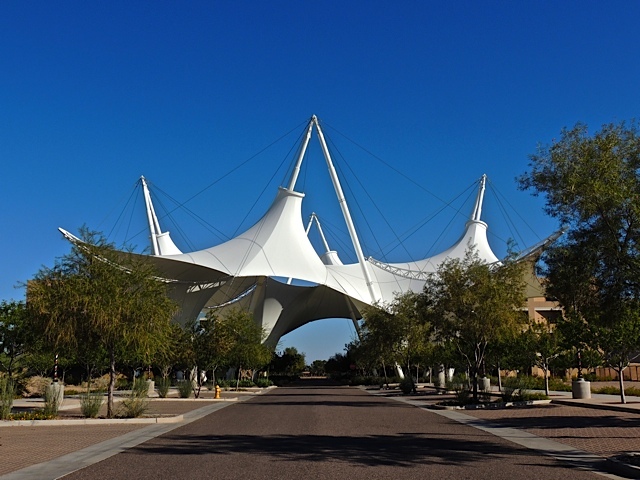 The complex is designated an Arizona Historical Site and it predates the incorporation of the city of Paradise Valley where it is located. 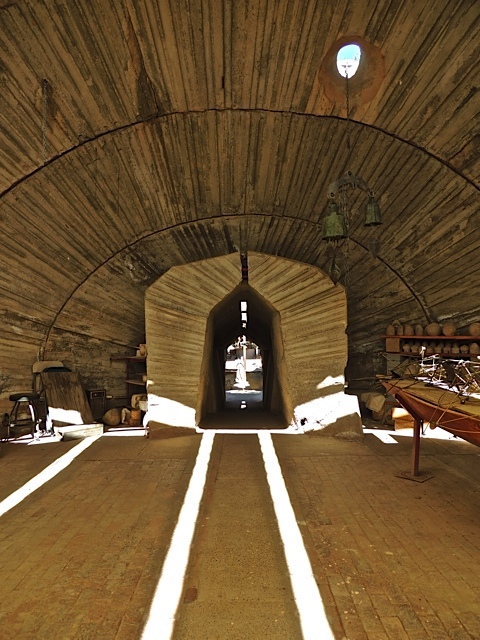 Paolo Soleri still lives on the site and he is well into his 90's yet he continues to work daily on writings and drawings and the custom bell assemblies as well as his architectural and urban design concepts. 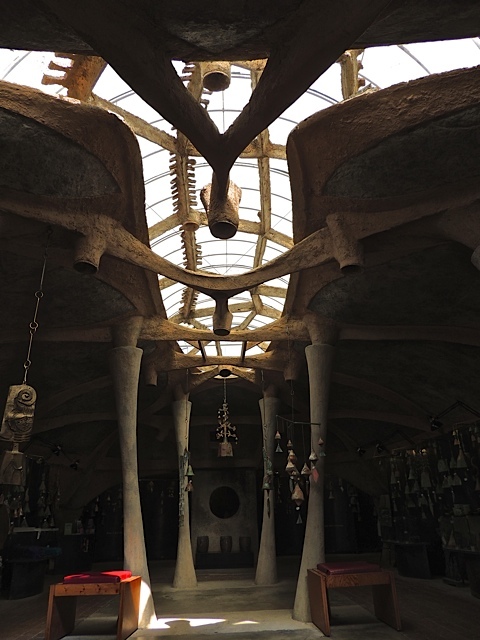 As of last year, he was still visiting his site at Arcosanti in northern Arizona at least once a week. 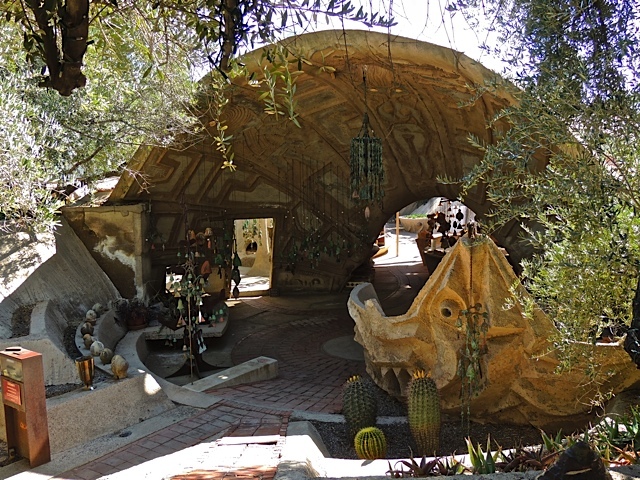 I visited Cosanti last weekend for the first time and I was taken with the place. I took many photos that I'll share with you from time to time. The place blends so well with nature making you feel like every building is as natural as the trees and rocks. Driving into the place is a magical experience after passing all the large and expensive homes that surround this spot on all sides. Yet while you are there, none of those places are visible to you and you soon forget you are in the residential heart of Paradise Valley. 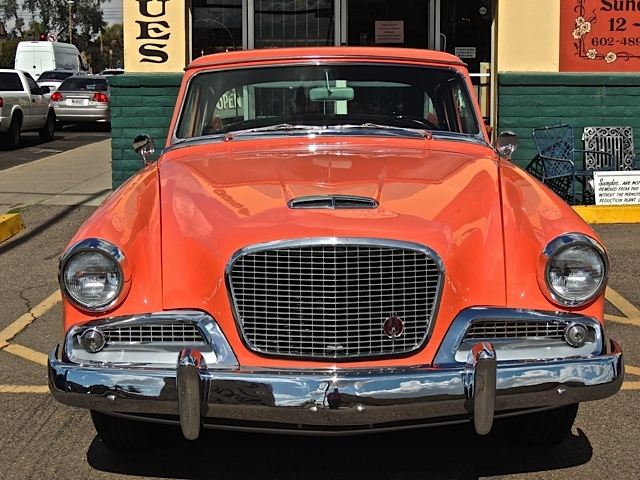 The emblem I teased you with yesterday was found on this beautifully restored Studebaker coupe. I found it sitting in front of a local antique store. I can't believe that no one guessed! I didn't see a "For Sale" sign on it but it was sitting in a predominate spot in front of the store's front door. 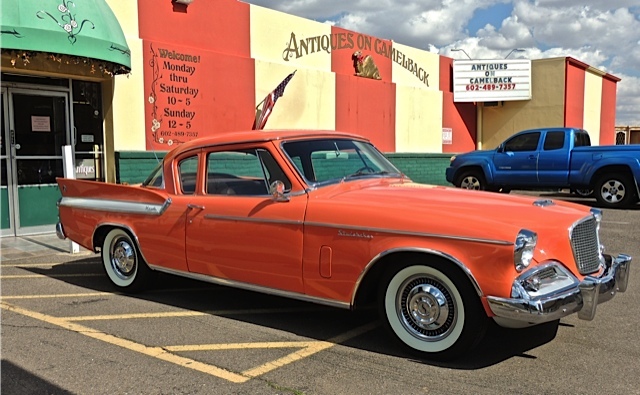 It was carefully restored both inside and out. I do have to add one comment on weather! We had SNOW in Phoenix yesterday. No, I didn't get any photos, in fact I didn't know it had happened until it was all over with. Of course, it didn't last. 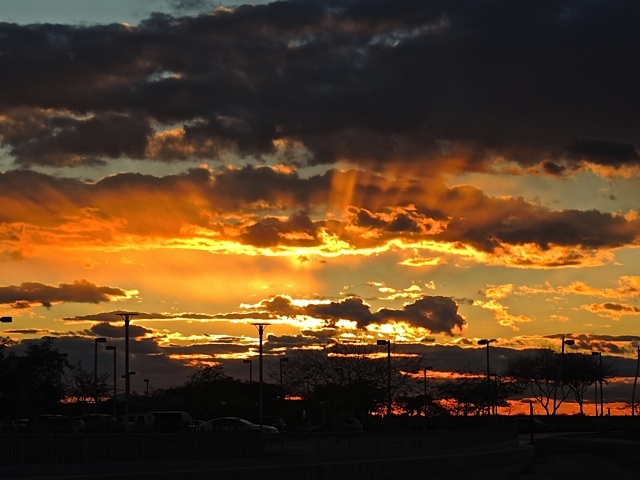 It was one of those fleeting moments that surprise you. Here is a test for you. 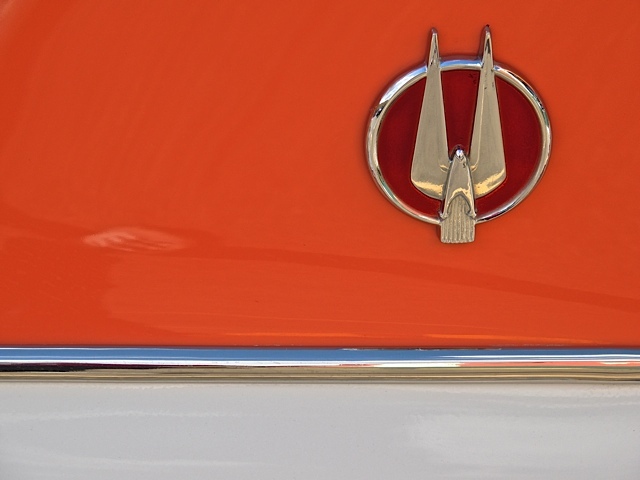 Does anyone recognize this emblem? I'll show you what it is tomorrow. 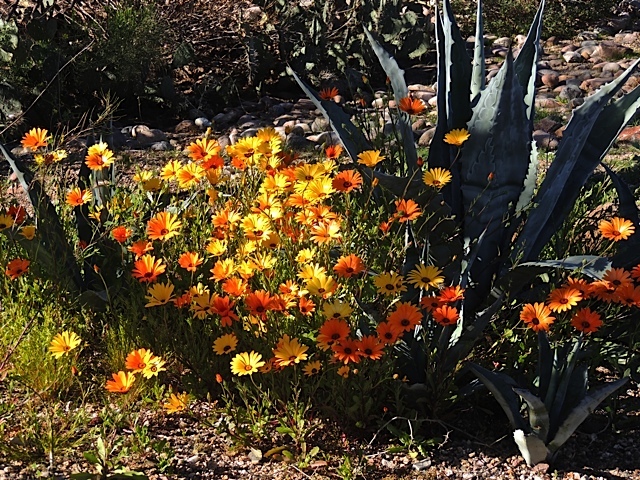 We know that spring is on it's way when see the African Daisies bloom wildly all over town. 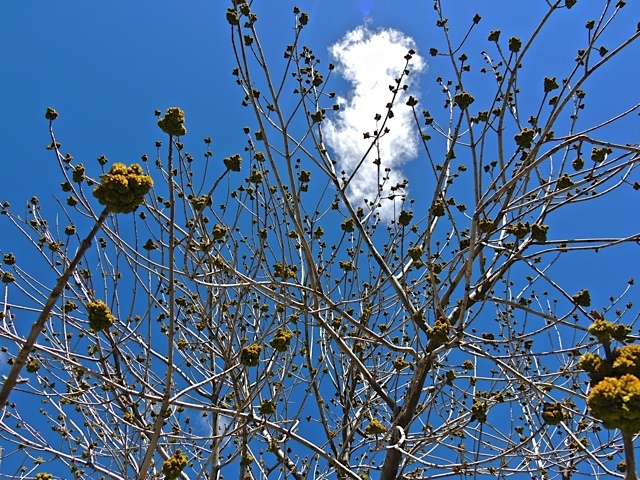 We have just come off of a beautiful weekend with great spring-like weather. The weather reporters are saying that we will have another cold front coming through on Wednesday of this week so it will be back to coats and scarves (and keeping fingers crossed "umbrellas") for a day or so. Sadly, this isn't a sign that I'm headed back to Italy. 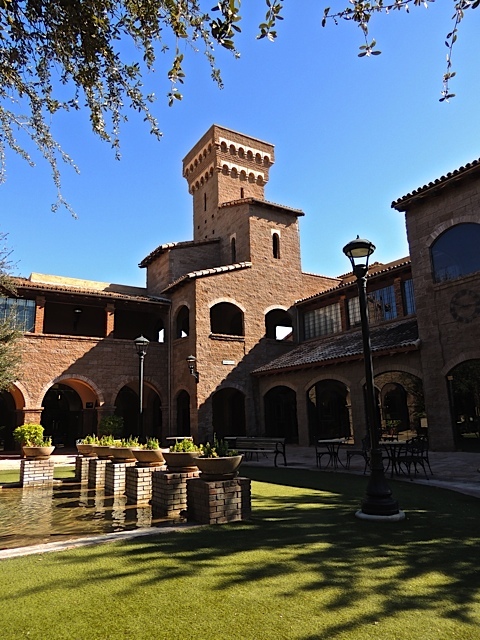 This actually is a Scottsdale landmark known as The Borgata, a shopping complex built in 1981 to resemble the Tuscan village of San Gimignano. When it opened, it housed many upscale and high-end retail stores and restaurants but, lately has fallen on hard times with only 13 out of the 40 retail spaces filled. I'm not sure why it has suffered so. It's location is surrounded by well known resorts and it's right next door to another thriving shopping complex of the more traditional kind. Last September, the property was sold to a developer who moved from Florida to here with plans to build a residential community. However, rumor has it that the developer could not get approval for the plans so now things are up in the air again for the few remaining tenants. I stopped here on Sunday to walk around and take a few photos. Now that I've actually been to San Gimignano, I can certainly see the resemblance. I mentioned when I posted photos of Skysong back in July of last year that I would go back on a "blue sky" day to photograph it again and so I did. Those white sails do look stunning against a bright blue sky. 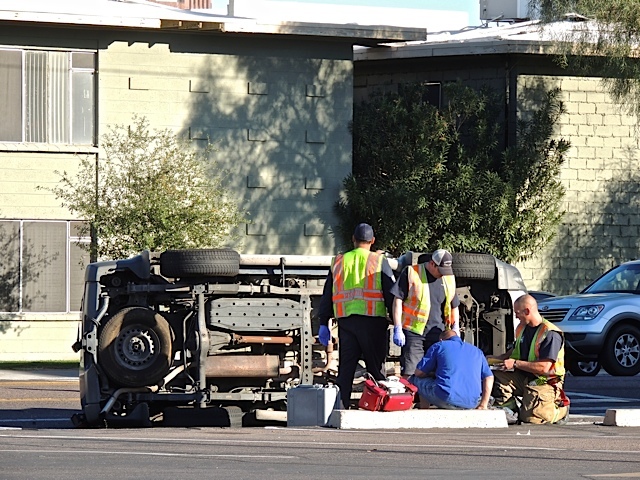 This is not the side of the car you are supposed to be seeing from the street. I was almost home when I came across this scene and had to detour through a parking lot to get past it. No one was hurt. Just a little shook up. Big box building, not a big box store. 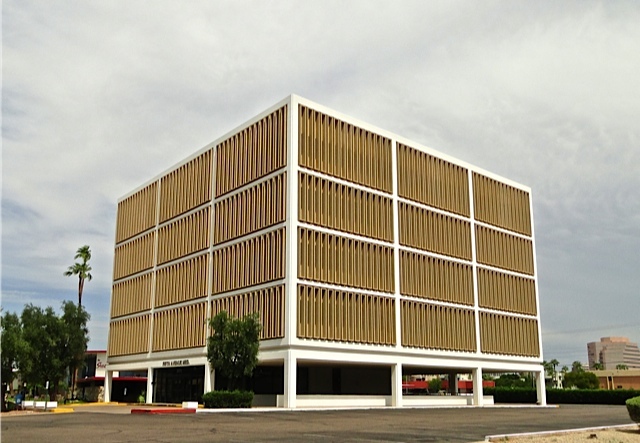 Here is another building featured in the book I have called "Mid-Century Marvels". This one dates back to 1967 and it was designed by Al Beadle. I've featured other Al Beadle buildings before and you can read a little about this interesting character here. This building doesn't have a fancy name, it's just called the 5th Avenue Medical Building. Other architects of the era built similar cube shaped buildings during this period and the Hungarian professor of architecture, Erno Rubik created his famous Rubik's cube as a functional teaching tool to help his design students understand three-dimensional objects. 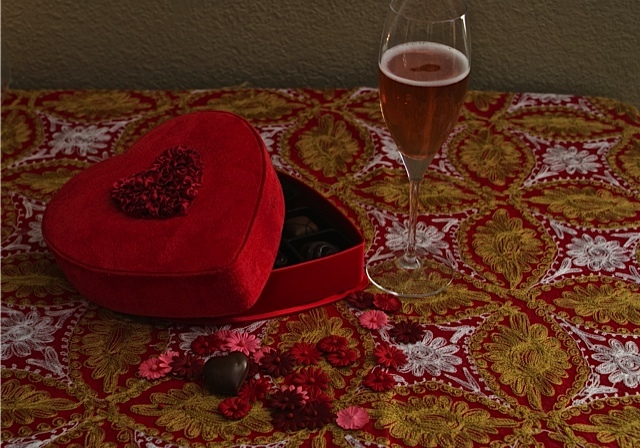 Let's see, champagne and chocolates....am I missing anything? Last week when I was meeting someone in Scottsdale, I had an hour to spare so I stopped in some of the many art galleries on Main Street. When I found these gorgeous and very unusual glass jars, vases and pitchers I fell in love. 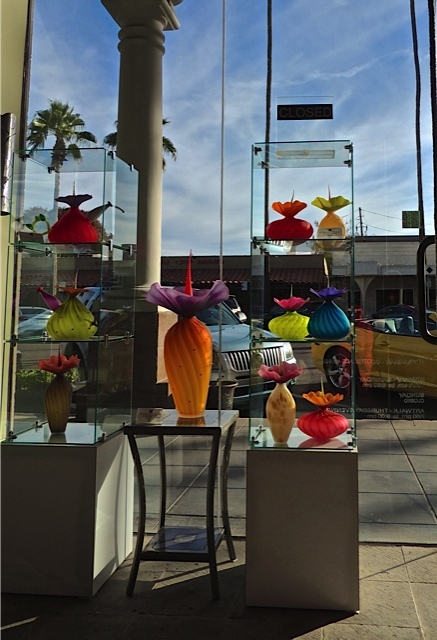 They are the creations of Kliszewski Glass. The husband and wife team of Bob and Laurie Kiszewski produce some of the most colorful and fanciful glass creations that I've seen. 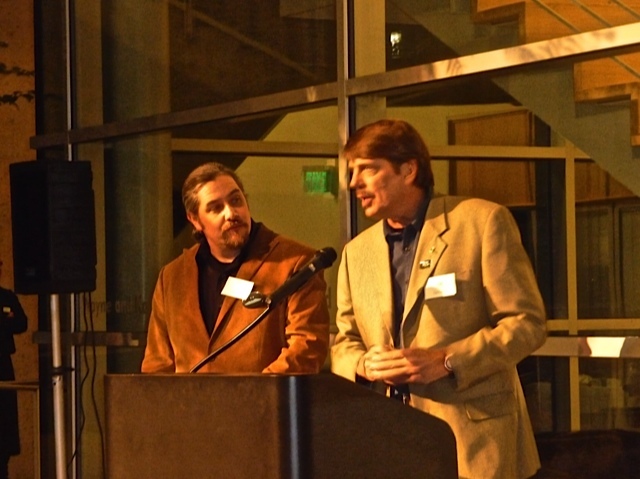 Click on the link to their web site to learn more. Alas, I didn't buy one but I did put it on my wish list. 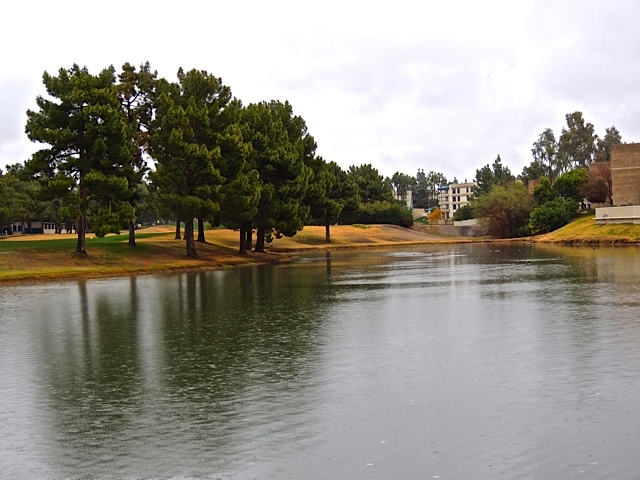 More rain in Phoenix all day yesterday. That's okay...the more winter rain, the more the wildflowers will be blooming in the spring. We had big clouds moving through the sky all day on Saturday so since I had to drive to Tempe for a play in the evening, I left a little early and stopped by the Tempe Lake to see if the sunset was going to show us some color. The sun is still far enough south that the position wasn't quite right to get it over the lake area but it was a gorgeous sunset regardless. 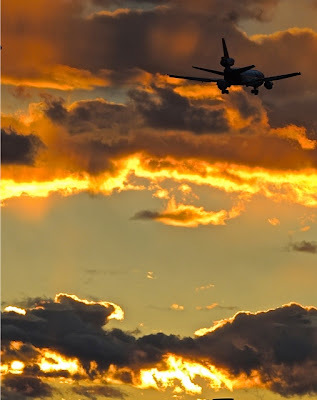 The Tempe lake sits right in the flight path for Sky Harbor International Airport so while I was snapping sunset photos, planes were roaring overheard on their approach to the airport. 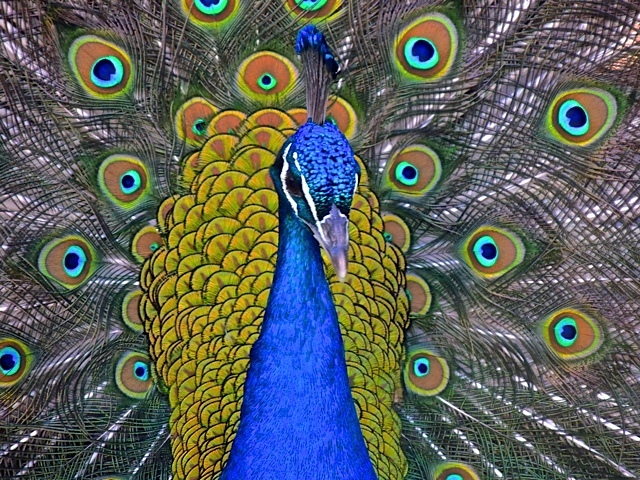 I honestly did not know that I captured one of them until I downloaded the photos. I bet you are wondering what this is. When I was in Scottsdale on Friday, I stopped on the corner of Frank Lloyd Wright and Scottsdale Road to see if I could get close the the Frank Lloyd Wright designed spire that commands attention at the corner. Turns out I could get close. I could (and did) walk right up to it in a small park setting complete with sculptures and fountains. 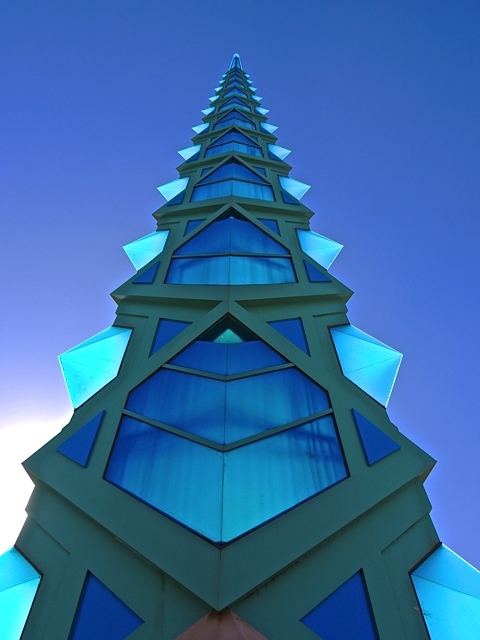 This spire was part of the plans that FLW created for an Arizona State Capitol building project back in 1957. The plans were speculative and had never been solicited by the state and were never used. You can see a photo of the model of the building here. 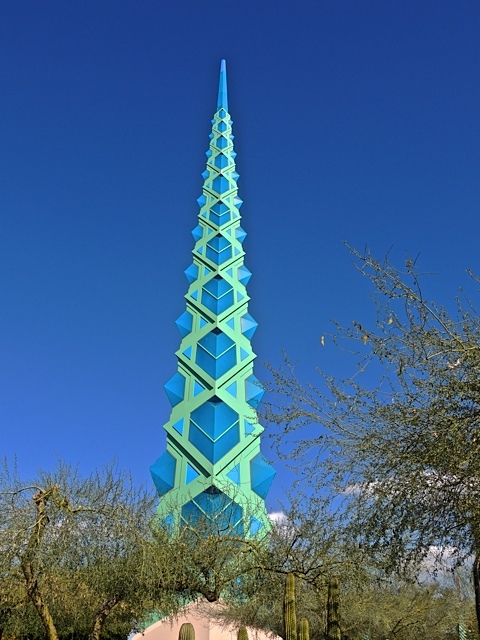 In 2004, architecture students at Taliesin West constructed this spire for this corner on the street named after the 'master'. I took some photos of the park and the sculptures while I was there and I'll share those in the future. One of these days I need to get there at night to get some shots. It is illuminated from inside at night. The Celebration of Fine Art is going on again in Scottsdale and I went yesterday to check out this year's artwork. Wow, what a selection. I talked to several artist's I've grown to know over the years and I admired some fantastic works. The painting of a white rose is the work of James McGulpin who's work just stunned me the very first time I visited this event. He paints the most realistic fruit in equally realistic glass bowls. I remember being awe struck the first time I saw his work. 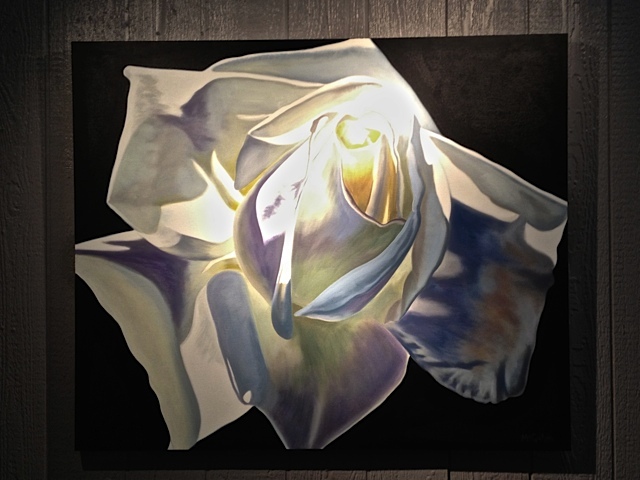 He also paints simply gorgeous flowers like this white rose. 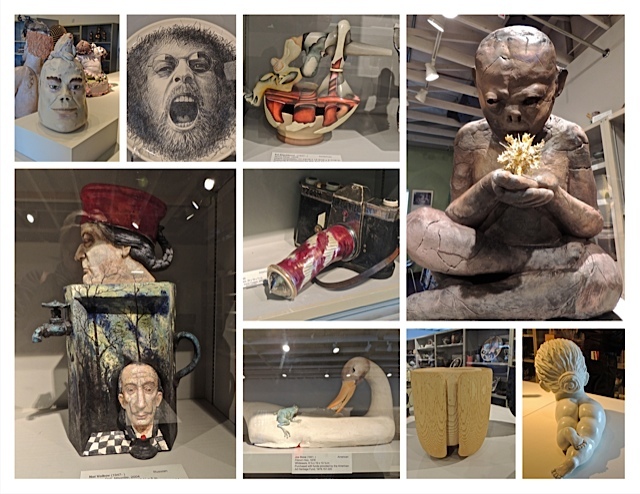 If you are interested in the show, it is open every day from January 12 through March 24th. You can visit their site here. The site has some great photos of the inside of the gallery. 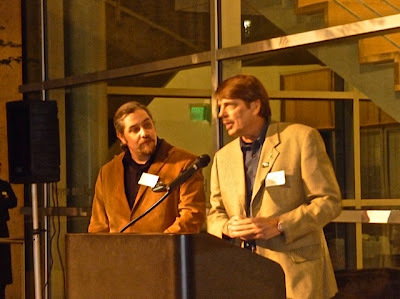 Julie and Dave (Scottsdale Daily Photo and Tamarindo Costa Rica Daily Photo) invited me to join them Wednesday evening to attend a National Geographic Live Presentation about the Birds of Paradise of New Guinea. 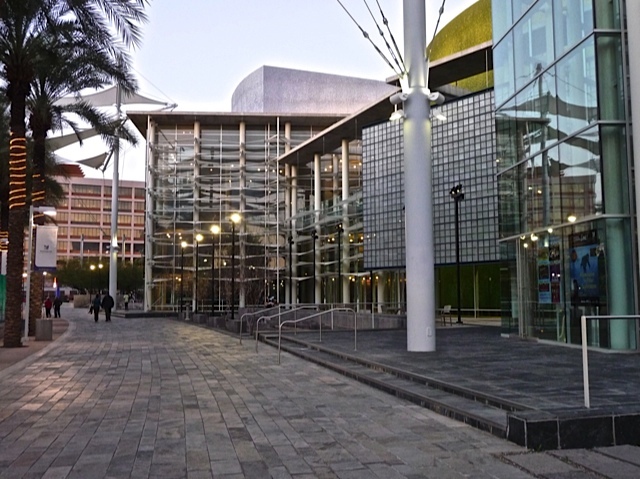 Above is a photo of the gorgeous Mesa Art Center in the city of Mesa where the show was presented. I'll be back here one of these days soon to take photos to to show you just how special this facility is. There was a reception before the presentation and we got to meet the two adventurers/photographers who spent several years studying the 39 different species of these incredible birds. Here are Ed Scholes and Tim Laman, the two who climbed trees and built 'blinds' in order to capture their amazing photos. I wish I could show some of their shots to you. If this event comes to your city, I highly recommend seeing it. Thanks Julie & Dave, it was a fantastic evening. 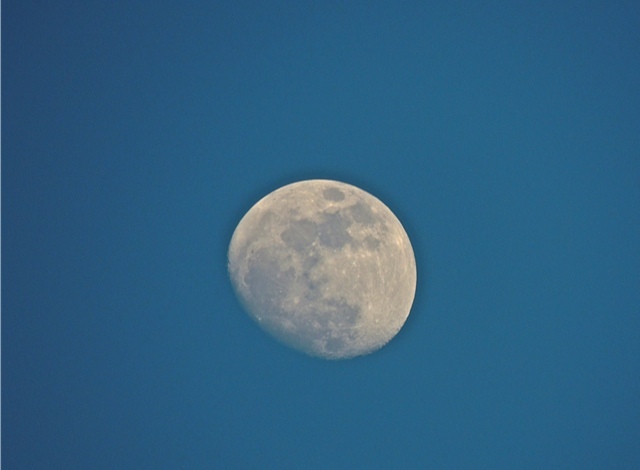 I took this photo the last week of January and liked how clearly it turned out for a day time shot. 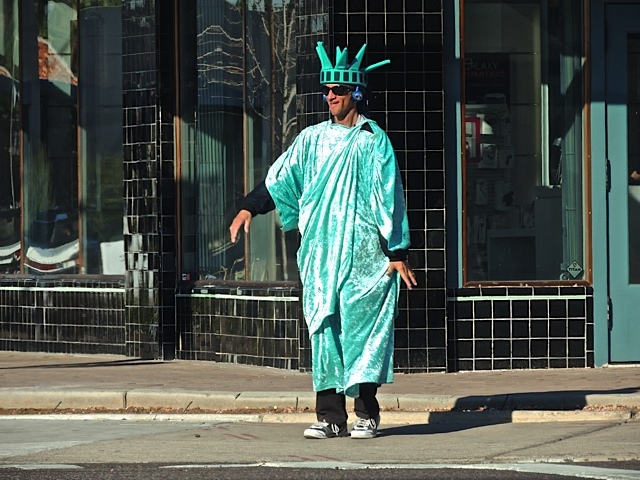 It's the time of year when tax accountants hire people to stand on street corners dressed like "Uncle Sam" or "The Statue of Liberty" in order to attract business. This fellow has his iPod going and he was practicing his dance moves. Does this type of advertising happen in your town? 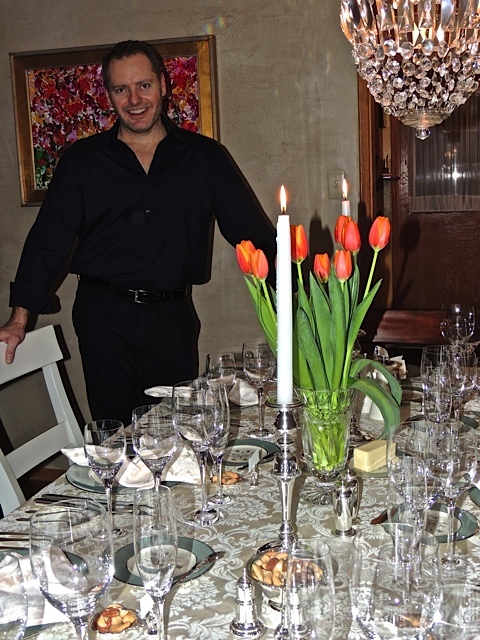 My close friend David hosted another elegant dinner party last Saturday night. 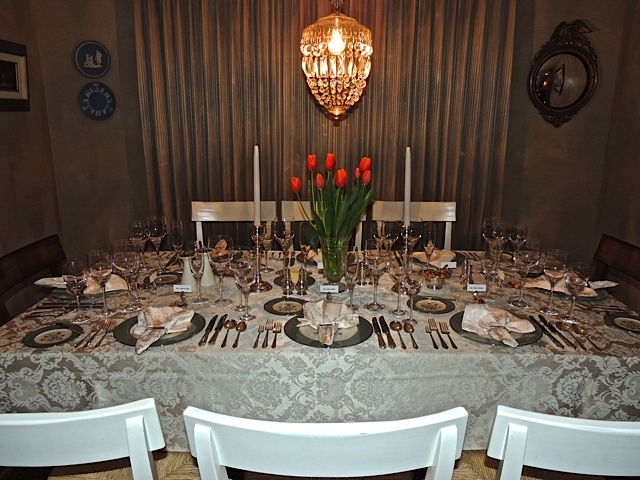 It was a beautifully executed event complete with wine pairing for every course. The eight people who enjoyed the food kept themselves engaged in lively conversation as the six courses were rolled out of the kitchen. Fourth Course: Roast Tenderloin of Beef with Bordelaise sauce, Blue Cheese & Rosemary mashed potatoes & Stout glazed Brussels Sprouts paired with Cabernet Sauvignon. That's quite a feat of cooking for one guy to pull off don't you think? I can safely say that everyone in attendance was impressed with the food as well as that well appointed table. 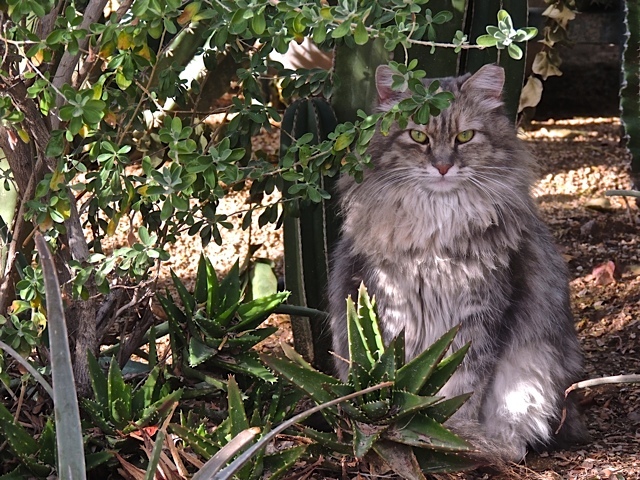 I spotted this handsome fellow hiding among the cactus and shrubs. He was watching me carefully from his little retreat. While I was in that parking lot I mentioned yesterday, I spotted this sign in a spot near the entrance to the restaurant. 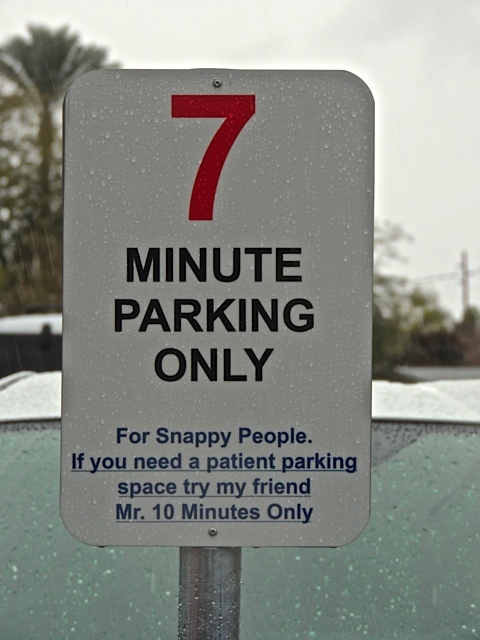 It seems that if you are really quick, you can park in this 7 minute spot. If you are going to take a little longer you had better opt for the 10 minute spot down the line. If you are really slow or if you are dining in, you had better park in the unmarked spots a little further away. I loved their sense of humor. After I made my plans to photograph my friend Heather with the red umbrella (yesterday's post), the rainy Saturday I've mentioned before arrived and umbrella's were suddenly everywhere. I pulled into a restaurant parking lot to pop out for some take-out lunch but as often happens, I was engrossed in a story on the radio so I sat there for a while before making a dash for the restaurant. 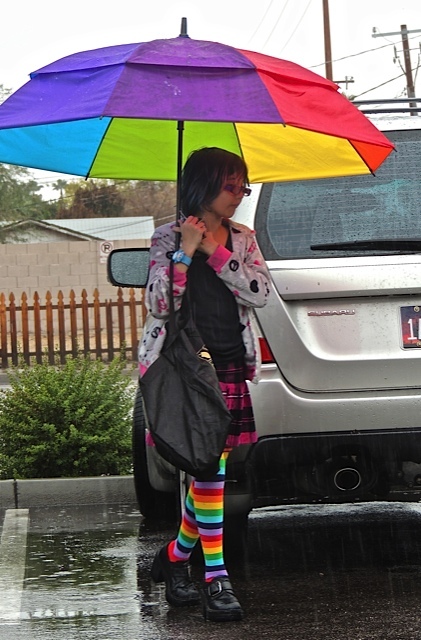 Suddenly I spotted this young girl with her rainbow umbrella and her rainbow socks. I jumped out of the car with my camera in hand so I could catch the scene. As you can see, the rain was coming down at a good pace so I jumped right back in the car before I and my camera got drenched. It's not the best photo but, I think the combination of umbrella and socks is just irresistible. I had a good friend model behind this huge umbrella for this shot. Click here to see more umbrella photos from all over the world.